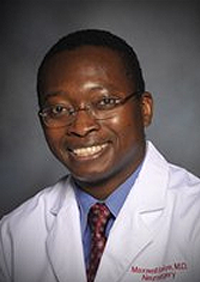 The overall goals of Dr. Boakye's laboratory is to understand the physiology and plasticity of the sensorimotor system in health and in patients with spinal cord and brain injury and to use that knowledge to develop new surrogate markers of recovery, new methods of injury prognostication and new therapies for spinal cord and brain injury. Our expertise in spinal neurosurgery and outcomes research as well as neurophysiological and neuroimaging research makes our lab unique in its ability to achieve a translational focus that bridges the gap between human and animal studies, basic and clinical research. Ugiliweneza B, Kong M, Nosova K, Huang KT, Babu R, Lad SP, Boakye M. Spinal surgery: variations in health care costs and implications for episode-based bundled payments. Spine (Phila Pa 1976). 2014 Jul 1;39(15):1235-42. doi: 10.1097/BRS.0000000000000378. Lad SP, Babu R, Ugiliweneza B, Patil CG, Boakye M. Surgery for spinal stenosis: long-term reoperation rates, health care cost, and impact of instrumentation. Spine (Phila Pa 1976). 2014 May 20;39(12):978-87. doi: 10.1097/BRS.0000000000000314. Lad SP, Babu R, Bagley JH, Choi J, Bagley CA, Huh BK, Ugiliweneza B, Patil CG, Boakye M. Utilization of spinal cord stimulation in patients with failed back surgery syndrome. Spine (Phila Pa 1976). 2014 May 20;39(12):E719-27. doi: 10.1097/BRS.0000000000000320. Mukherjee D, Sarmiento JM, Nosova K, Boakye M, Lad SP, Black KL, Nuño M, Patil CG. Effectiveness of radiotherapy for elderly patients with anaplastic gliomas.J Clin Neurosci. 2014 May;21(5):773-8. doi: 10.1016/j.jocn.2013.09.004. Epub 2013 Dec 16. Patil CG, Sarmiento JM, Ugiliweneza B, Mukherjee D, Nuño M, Liu JC, Walia S, Lad SP, Boakye M. Interspinous device versus laminectomy for lumbar spinal stenosis: a comparative effectiveness study.Spine J. 2014 Aug 1;14(8):1484-92. doi: 10.1016/j.spinee.2013.08.053. Epub 2013 Oct 4.